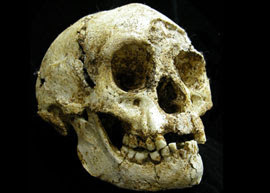 Hobbit in the Haystack: Homo floresiensis and Human Evolution - Watch it Online! 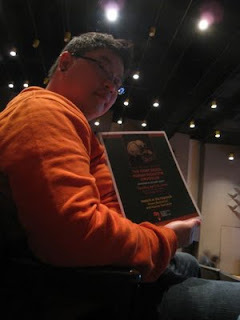 Earlier this year, I've blogged about the 2009 Human Evolution Leakey Symposium at Stony Brook that I went to. For more about that blog post, click here. 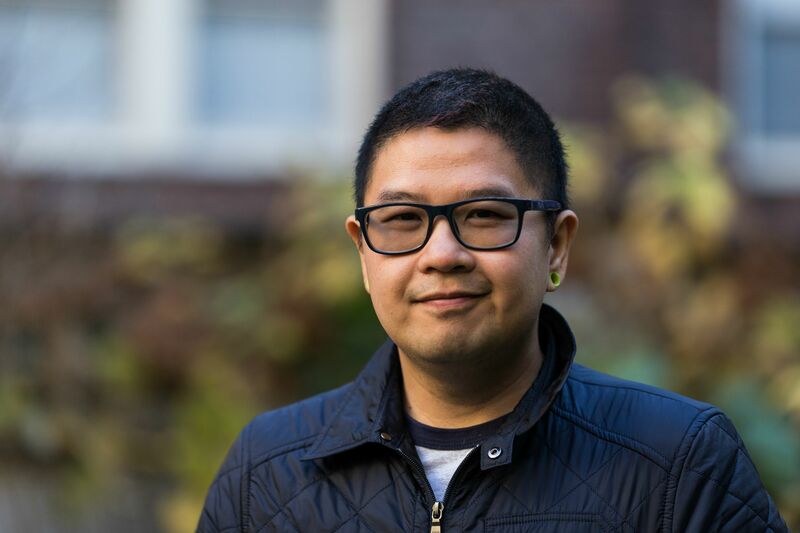 The symposium, entitled "Hobbit in the Haystack: Homo floresiensis and Human Evolution" can now be streamed live through the Stony Brook website. The website also includes previous Human Evolution Leakey symposia. Click here to watch. Thanks to Afarensis: Anthropology, Evolution and Science for the heads up! Not much to write about today but I want to share an article by Rhett A. Butler "Rehabilitation Not Enough to Solve Orangutan Crisis in Indonesia" from mongabay.com. This is a really good article about orangutans in Indonesia and their future in the wild. While orphaned orangutans are brought in to be rehabilitate, there are growing concerns that they are destined to live in captivity for the rest of their life because of the dwindling habitat in Indonesia and Sumatra. Anyone knows if there are any internship or volunteering opportunities at zoos or museums around New York City? I am not expecting to get paid (I wouldn't mind if it does! ), experience is more than suffice. I'm interested in getting more curatorial, research, teaching and/or conservation experience. Any information or help is appreciated! With Mike Moorwood from University of Wollongong and Thomas Sutikna from Indonesian Center for Archaeology, Debbie Argue compared 60 skulls and skeletal features from two individual hobbits to those of hominins, chimpanzees and gorillas using cladistic analysis. The result shows that Homo floresiensis "probably took one of two evolutionary paths from Africa to Flores. One began 1.66 million years ago, the other 1.9 million years ago". A research from Duke University by Daniel Schmitt, associate professor of evolutionary anthropology, and Tracy Kivell, a post-doctoral research associate, shows that human evolved from tree climbing ancestors, not from knuckle-walkers. Schmitt and Kivell examined and compared the wrist bones of humans and African apes. Their research, "Independent evolution of knuckle-walking in African apes shows that humans did not evolve from a knuckle-walking ancestor", was published in the Proceedings of the National Academy of Sciences on August 10th, 2009. They also found that knuckle walking evolved at least two different times; gorillas fundamentally knuckle walk differently than chimpanzees and bonobos. Kivell and Schmitt think this suggests independent evolution of knuckle-walking behavior in the two African ape lineages. Some scientists point to features in the human anatomy as our own vestiges of a knuckle-walking ancestry. One notable example is the fusion a two wrist bones that could provide us extra stability, a feature we share with gorillas, chimps and bonobos. But some lemurs have that feature too, and they do a variety of different movements in the trees but do not knuckle-walk, Kivell said. Altogether, the evidence leans against the idea that our own bipedalism evolved from a knuckle-walking ancestor, the pair wrote. "Instead, our data support the opposite notion, that features of the hand and wrist found in the human fossil record that have traditionally been treated as indicators of knuckle-walking behavior in general are in fact evidence of arboreality." In other words, a long-ago ancestor species that spent its time in the trees moved to the ground and began walking upright. There are no fossils from the time of this transition, which likely occurred about seven million years ago, Kivell and Schmitt said. But none of the later fossils considered to be on the direct human line were knuckle-walkers. First Ever Malaysian Tarsier Study Begins in Sabah. At the Danau Girang Field Center, Lower Kinabatangan Wildlife Sanctuary, a young male tarsier named Jamil was tagged with a small radio collar as part of the first study to better understand the life of this elusive nocturnal primate species. Dr. Benoit Goossens, the director of Danau Girang Field Center said there was a need for better understanding of habitat needs, diet and social organisation of tarsiers, key to conservation policies for these unique little creatures. 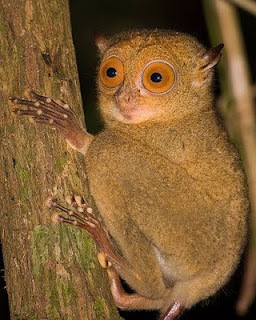 Read about the article from The Star here: First tarsier study begins. 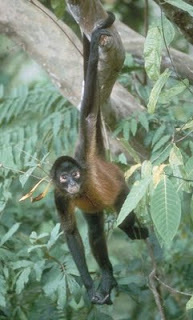 A Geoffroy's Spider Monkey hanging on the branch. Photo from Primate Info Net. Wild Geoffroy's Spider Monkeys (Ateles geoffroyi) or Black-handed Spider Monkeys had been documented using tools to scratch themselves, according to a new publication "Tool use in wild spider monkeys (Ateles geoffroyi)". Important to note that spider monkeys do not have thumbs, only four fingers (picture below) so tool manipulation is rather limited but nonetheless a rather interesting find. 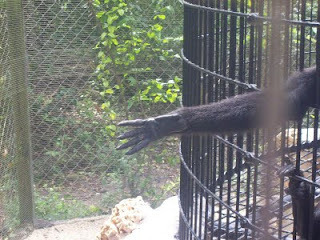 The hand of a Geoffroy's Spider Monkey. Note that they do not have a thumb and only four fingers. Photo from Wikipedia. Published in the latest issue of Primates, authors Stacy Lindshield and Michelle Rodrigues collected their data from wild spider monkeys at El Zota Biological Field Station in northeastern Costa Rica. There were three documented instances where these spider monkeys used tools to scratch themselves. The first to scratch was an adult female. Holding a small, leafy branch in her hand, she scratched her chest and abdominal regions. The second, another adult female, used a detached stick lacking side branches and leaves to scratch her left side. She chewed the tool tip between bouts. The third individual, a juvenile female, first chewed the distal tip of a stick before scratching the underside of her tail and her genital region. Seems that this publication coincide with the call for an inter-disciplinary field that seek to examine primate tool use in a long term, evolutionary context. Julio Mercader, archaeologist from University of Calgary, said "We used to think that culture and, above anything else, technology was the exclusive domain of humans, but this is not the case." Read the full article on Discovery: Spider Monkeys Invent Medicated Body Scratcher. 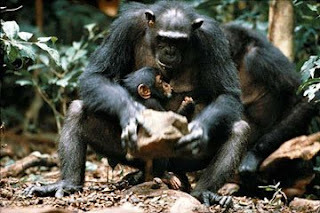 A chimpanzee mother using rocks (hammer and anvil) to break open nuts, an example of tool use in primates. A new branch of archaeology is being introduced by international scientists. Led by University of Calgary archaeologist Julio Mercader and 17 other co-authors of the paper "Primate archaeology", advocate a new "Paleoanthropology meets Primatology" inter-disciplinary field that seek to examine primate tool use in a long term, evolutionary context. Read more about the article from redOrbit: International Scientists Establish New Branch Of Archaeology.